The traditional Thanksgiving Day meal of a groaning plate of food can be tough on everyone's digestive system. Somehow over time, the original Pilgrim meal of lean protein and fresh vegetables have been replaced with heavy, greasy, fried, and buttery foods. To help you to navigate your way through the maze of foods that will make you feel like you are bursting at the seams, we offer you the following recipe for a Thanksgiving Day that leaves you with a healthy, quiet and satisfied belly. Keep your stress level as low as possible. If you are hosting the holiday, delegate, delegate, delegate! Make lists and throw out all signs of perfectionism. Anything that can be put off to next week, should be put off to next week. Get plenty of rest and sleep. Keeping yourself on a predictable sleep schedule will help your digestive system to stay regular. Engage in light exercise for overall health and added stress relief. Practice relaxation exercises regularly to offset holiday pressure. Eat small, frequent and healthy meals. Make sure your body is in tip-top shape prior to the main event. Eating foods high in fat and sugar often leads to the craving for more, leaving you at risk for unhealthy choices on the big day. Shop for high-quality ingredients. The key to both a successful meal and a happy belly is the use of foods that help your body to thrive. When possible, choose organic produce and a free-range turkey. Try to avoid foods that are overly processed or contain a lot of artificial ingredients. If you make wise choices regarding which foods to eat, you will be rewarded with a sense of physical well-being. In general, avoid anything that is fatty, creamy or fried, as foods with a high-fat content may result in unpleasant digestive symptoms. Be cautious about your choice of drink as well, as alcohol and caffeine can both be irritating to your system. Think lean protein: shrimp, barbequed (not fried!) wings, and cheese (if you are not lactose intolerant). Raw fruits and vegetables are generally healthy choices but may be troublesome for some digestive systems. Choose white meat turkey, as dark meat has a higher fat content which might cause stomach upset when a part of a large meal. Make sure that the turkey is prepared according to food safety guidelines so as to reduce your chance of food poisoning. Baked sweet potatoes are a better option than buttery mashed potatoes. Steamed vegetables are generally easy to digest. Cooked fruits such as applesauce and cranberry sauce are also generally well-tolerated. Take a large helping of the healing powers of gratitude. 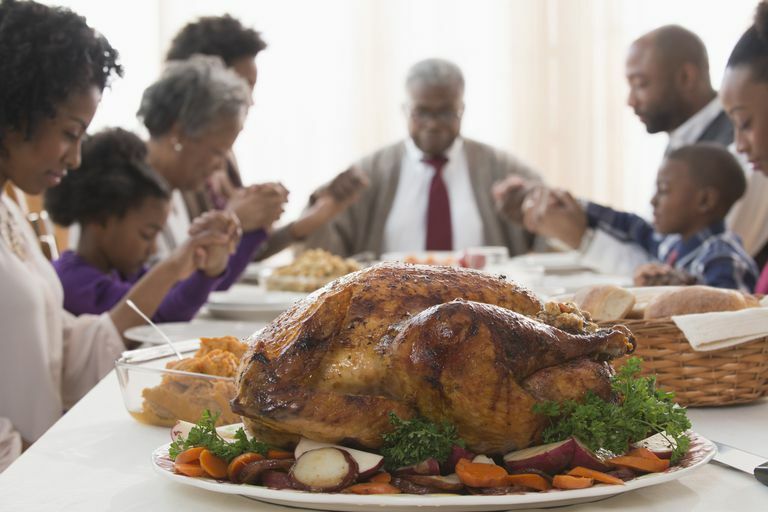 Give thanks for the meal and the special gift of the individuals with whom you are sharing the holiday. Enjoy the inside of pie! Eating healthy does not have to mean total deprivation. Have a piece of pumpkin or apple pie, but only eat the filling. In this way, you will avoid the hard-on-the-system crust. At the end of the day, take stock as to how you feel. Were you able to make healthy food choices in spite of the smorgasbord of unhealthy choices? Does your stomach feel sated and quiet? What would you do differently next year? Congratulate yourself for paying such good attention to the most important blessing of all, yourself. If you have irritable bowel syndrome (IBS) and you find that your symptoms are very much affected by the foods you eat, you may want to look into choosing foods that are low in FODMAPs (carbohydrates that have been found to contribute to IBS symptoms). This will go a long way for helping you to avoid unpleasant symptoms.